This piano teaching game is sure to be a hit with the kinesthetic learners in your studio! It’s a fantastically fun way to familiarize your students with the sharps found in the commonly played keys of G, D, A and E Major. To play this game, you will need to paint a large piece of cardboard with any design you choose. We went with a spring theme, but I’m certainly not an artist! Cut out 4 holes and label as in the picture above. Purchase 4 beanbags or small balls from your local dollar store. Print out and cut up the Key Cards found here. 1. Have your student choose a Key Card from a hat. 2. The student calls out what sharps make up that key signature, and then throws a beanbag into the hole(s) that corresponds. 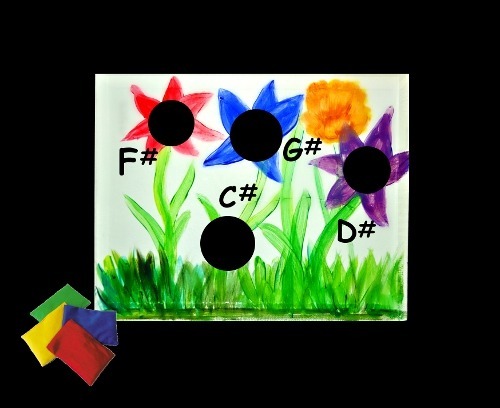 For example – if they draw the “D Major” card, they throw beanbags through the F# and C# holes. If they miss, they draw a new card and try again. If they make the shot, they keep the card. 3. Continue to draw cards from the bucket and toss beanbags accordingly until all the cards have run out.